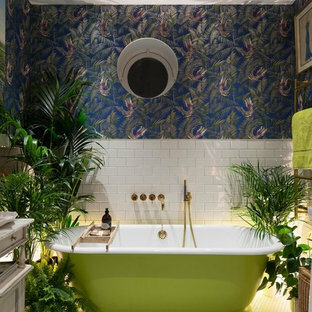 Inspiration for a bohemian bathroom in London. 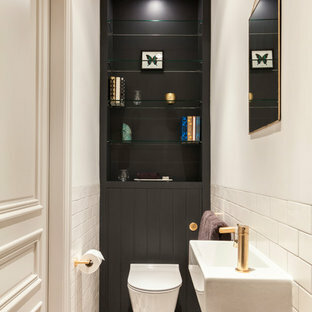 This is an example of a medium sized eclectic bathroom in London with flat-panel cabinets, black cabinets, a walk-in shower, a wall mounted toilet, black walls, marble flooring, marble worktops, black floors and a sliding door. 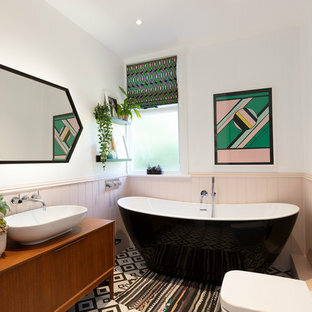 Photo of a bohemian ensuite bathroom in London with a freestanding bath, multi-coloured walls, white tiles and metro tiles. 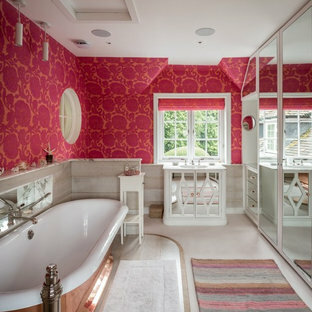 Inspiration for a medium sized eclectic bathroom in Hampshire with beige floors, freestanding cabinets, white cabinets, a freestanding bath and pink walls. This is an example of a small eclectic bathroom in London. An East London former artist's studio in the heart of Shoreditch was brought to life with a lively mix of classic Scandinavian design layered with punches of colour and pattern. Bespoke joinery sits alongside modern and antique furniture. A deco Venetian mirror adds sparkle in the Asian influenced sitting room which displays pieces sourced from as far afield as Malaysia and Hong Kong. Indian textiles and a handwoven beni ourain carpet from Marrakech give the bedroom a relaxed bohemian feel, with simple bespoke silk blinds commissioned for the large lateral windows that span the room. In the bathroom the simple Fired Earth tiles sing. A couple of carefully chosen accessories found in a Parisian market add a dash of je ne sais quoi. 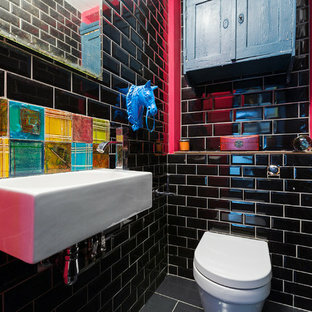 This is an example of an eclectic bathroom in London. Inspiration for a small bohemian bathroom in London with a wall mounted toilet, black tiles, black walls, ceramic flooring, grey floors, metro tiles and a wall-mounted sink. Period bathroom with Spanish inspired encaustic tiles. These Ca'Pietra Casablanca pattern tiles are suitable for interior floor and walls. They are handmade using natural materials. Large bohemian ensuite bathroom in London with flat-panel cabinets, brown cabinets, a walk-in shower, a one-piece toilet, grey tiles, mosaic tiles, grey walls, porcelain flooring, a built-in sink, blue floors and an open shower. Photo of a large bohemian bathroom in Cornwall with a freestanding bath, grey walls, a vessel sink, marble worktops, brown floors and an open shower. This is an example of a small bohemian family bathroom in Other with freestanding cabinets, medium wood cabinets, a built-in bath, white tiles, ceramic tiles, blue walls, cement flooring, a console sink, wooden worktops and blue floors. A raised textured blown vinyl wallcovering featuring extravagant pink flamingoes perfect for a bathroom. 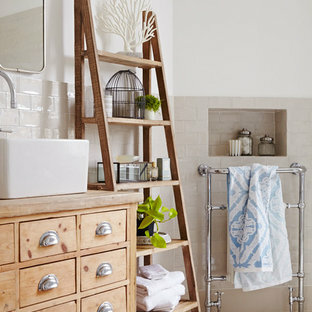 Design ideas for a bohemian bathroom in Sussex. 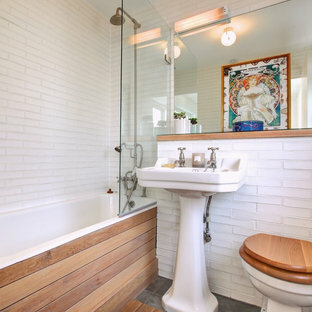 Design ideas for an eclectic bathroom in London with a claw-foot bath.